I was looking for a chili without beans and found Texas Chili. Apparently traditional Texas Chili does not include beans, so I became interested in the Lone Star state’s chili making ways. And, I have to say, I love their chili style. The focus is more on the beef, extra spices, and cooking on the stovetop for a long time, until the consistency of the chili is thick and rich. And, oh yeah, there’s a cup and half of amber ale beer mixed into the dish. Gotta love it. Follow the instructions below exactly. 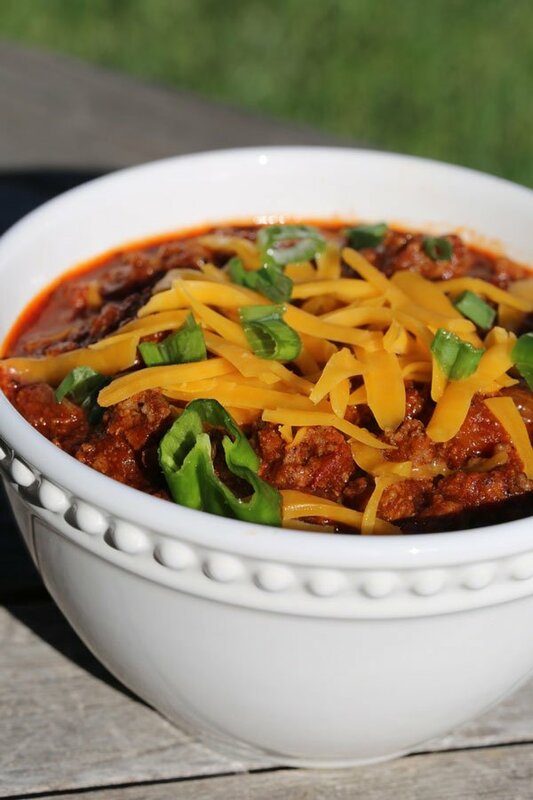 I know it seems excessive to cook on the stove top for about an hour, but its the slow cooking process that gives the chili such a rich and flavorful taste. Have your toppings ready. Freshly shredded cheddar cheese is SO much better than already shredded cheese. Make the effort, it makes a difference. Freshly shredded melts better, is more flavorful, and the texture is so soft and moist, as opposed to already shredded’s drier texture. Sliced shishito peppers or jalapeños are wonderful on top of this rich chili. Chopped spring onions are also a big winner for this dish as well. We served the chili with Tostitos corn tortilla chips for scooping out the delicious chili. It was just perfect. What does Texas Chili have in it? Beef, crushed tomatoes, oregano, cumin, smoked paprika, chili powder, bay leaves, and amber ale beer are the main ingredients. There is some debate that true Texas chili does not include tomatoes. However, beans are never in authentic Texas Chili, and there does not seem to be any debate about that. 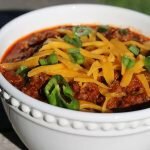 Why is Chili the state food of Texas? 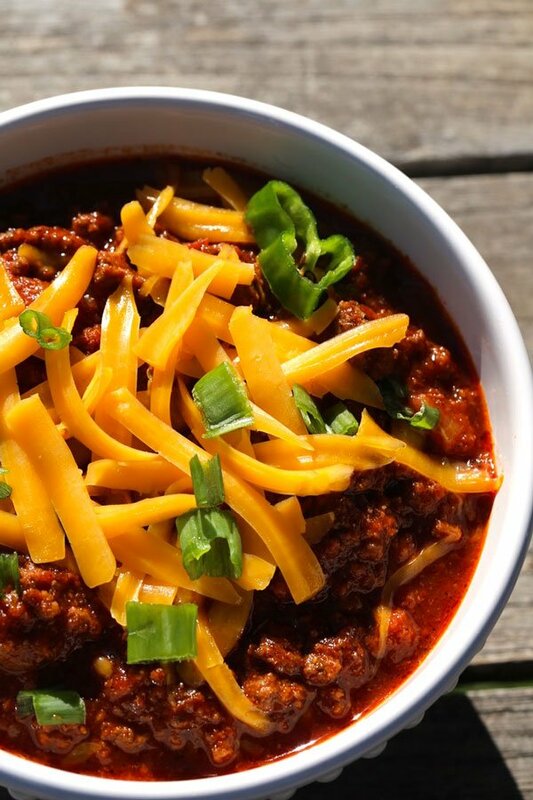 In the year 1977, Texas named their official state food to be chili. Apparently, Texas is the only state that can make a “real” bowl of red chili. The definition of red chili is only beef, red peppers, and spices, no tomatoes. 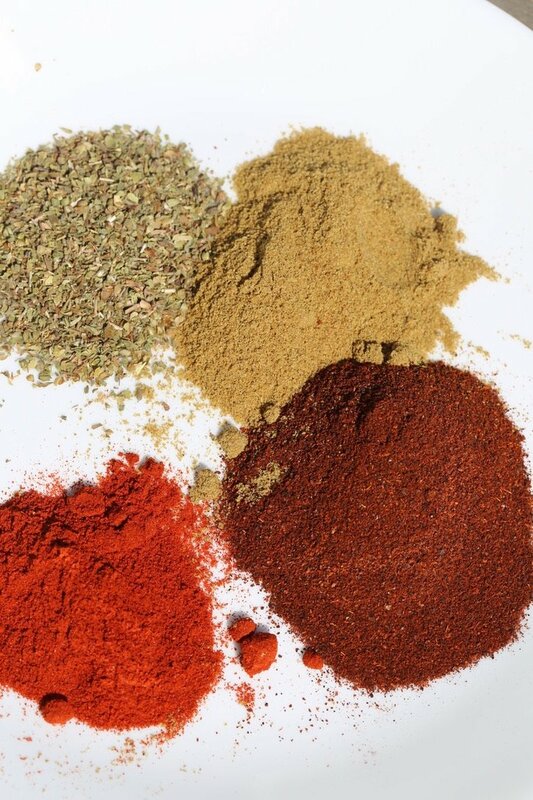 Above, you can see a beautiful overhead view of the delicious spices included in this chili: oregano, smoked paprika, chili powder and cumin. I LOVE the smell of smoked paprika. So glad to have finally discovered this spice. You should try it too. Its totally cool. Hope you enjoy this chili as much as we did!! 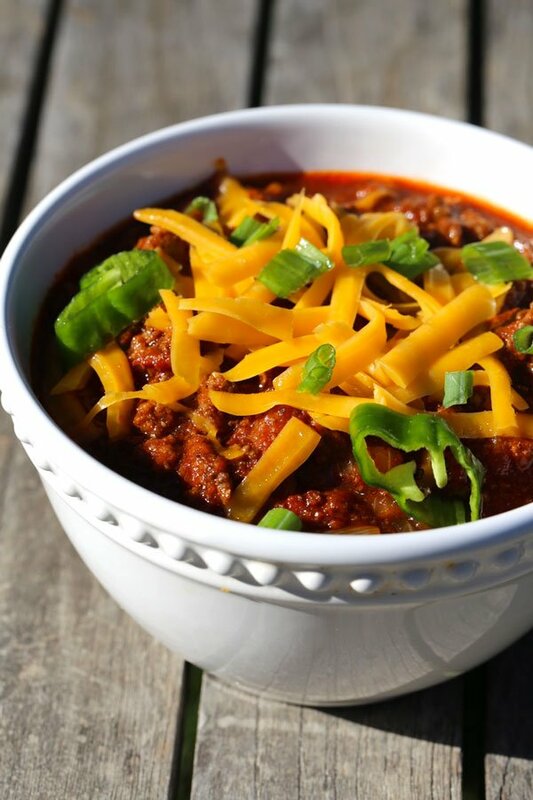 SAVE THIS TEXAS CHILI TO YOUR “DINNERS” PINTEREST BOARD! In large saucepan, over medium-high heat, brown the beef crumbling it as it browns. Remove browned meat to a paper towel line plate when done. Remove all but 1/4 cup of fat in the pan. If there's not enough fat, use vegetable oil as needed to cook the onion. Add the onion and cook, on medium, stirring occasionally, until browned and soft, about 7 minutes. Stir in garlic, chili powder, cumin, smoked paprika, and oregano and cook, stirring constantly to avoid burning the spices. Cook until fragrant, about 1-2 minutes. Return browned beef to the saucepan and add the salt, pepper, bay leaves, crushed tomatoes, tomato paste, Better than Bouillon, 3/4 cup amber ale beer and 1/3 cup water and simmer for 20 minutes. Add the remaining 3/4 cup beer, another 2/3 cup water, and masa and simmer for 30-40 minutes, stirring occasionally, until chili is thick. Serve with shredded cheddar cheese, sour cream, tortilla chips, jalapeños or anything else that sounds good to you. Enjoy!